Finally I have had a chance to take some photographs to show what I have been working on over the last 6 weeks. I have been using Battlefront and Forged in Battle miniatures and vehicles. Generally both are quite acceptable, but Battlefront (FoW) certainly has some minor problems with quality control. I bought an airbrush, so I have been using a basecoat of white (what a treat not to use aerosol cans anymore) and then spraying both the vehicles and the miniatures with their primary colour. I used FoW info as a colour guide using both Vallejo and GW paints. I then block in the equipment, flesh, and wheels and tracks etc. I then use a sparing coat of the black pigment AP followed by some AP matt spray (this I find, is a better quality product than Dullcote). I occasionally dry brush after the matt varnish, but it really does not make a whole lot of difference. 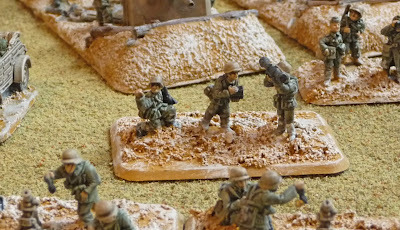 I am generally basing the figures to FoW standards, which seems to be OK for all the rulesets I have looked at, including IABSM and Rapid Fire. 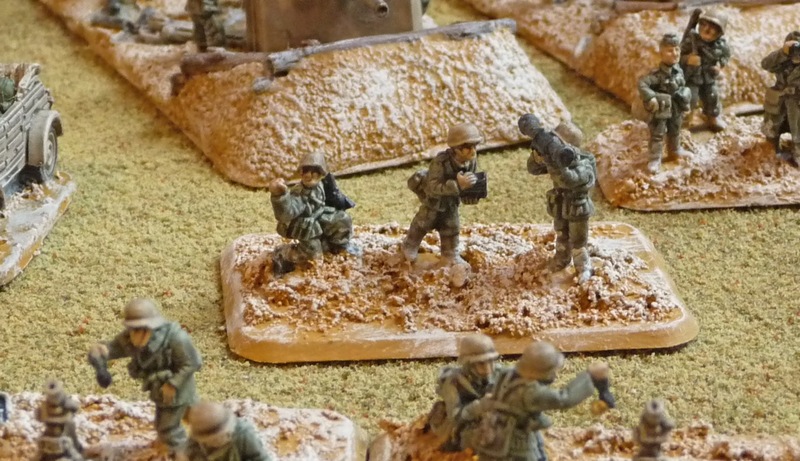 The bases are from FoW and once the figures are affixed, a coarse Golden gel is applied. I am using a yellow ochre for the base colour, dry brushed with buff. I still have not decided what sort of flock or foliage to use. Need to work on terrain before I make that decision. 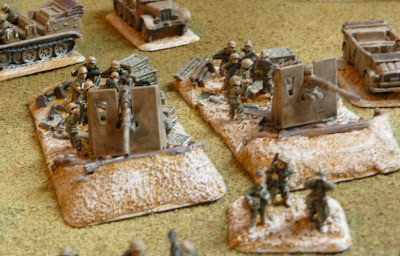 Most of the miniatures are correct for the North African theatre, but there are a few errors, which I will try to point out as I go along. Still have a long way to go to build the 15. 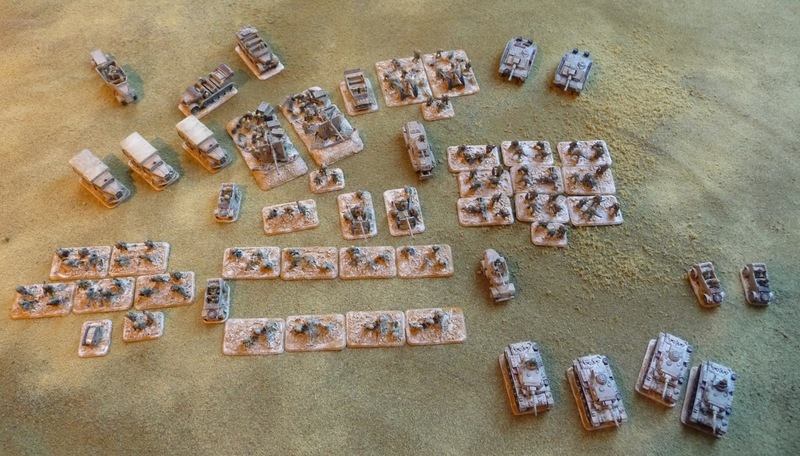 Panzerdivision, but I am close to what I need for a starter scenario. I have about half as many 8th Army figures and vehicles done, so a bit more work to be done there. I am spending about 5-10 minutes on each figure and vehicle, so you can get a lot done in a short time. Engineers from Pionier Battaillon 33. 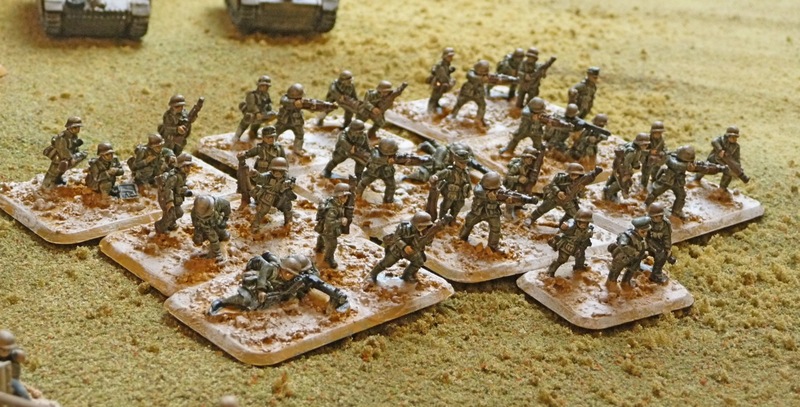 This is the Battle Front platoon pack with their Goliath. I can figure out the mines and flamethrowers, but the rest of the stuff puzzles me. 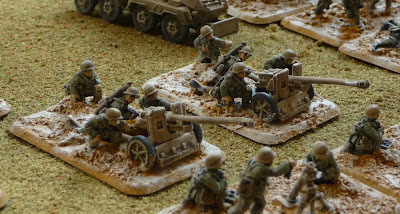 Heavy weapons, with Mauser MG34 HMG to the front and some GrW 34 80 mm medium mortars in the back row. If these are heavy mortars, I would like someone to point this out. These are all Forged in Battle figures. Battlefront 8.8 cm FlaK 36 guns used as antitank weaponry. A Kfz 15 field car can be seen to the right. 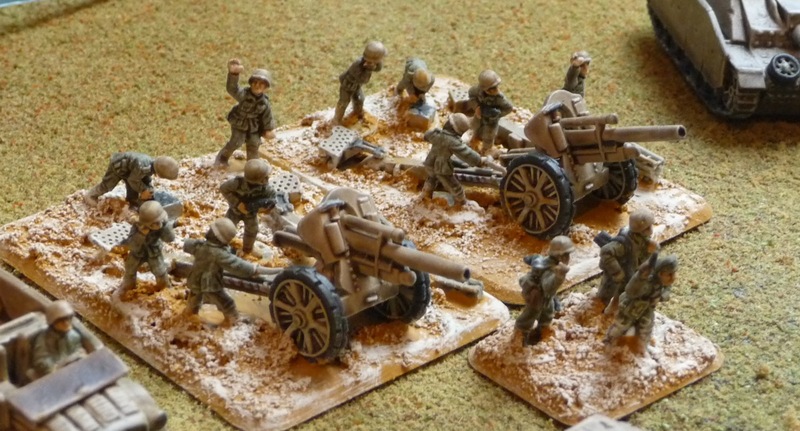 Battlefront 10.5 cm leFH18 Light Howitzers from Artillerie Regiment 33. 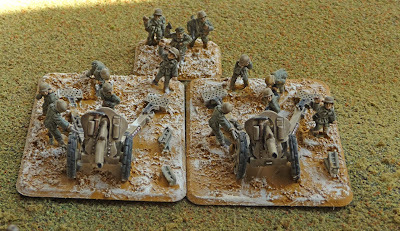 Sd.Kdf 7 Tractors from Battlefront. Forged in Battle Panzergrenadiers from Schützen-Regiment 105. Side view of the pioniers. The kübelwagons are from Forged in Battle. 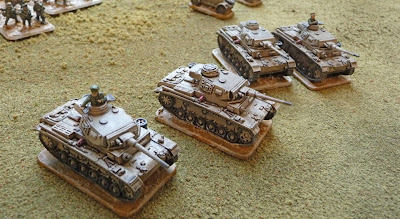 Panzer III J's from Forged in Battle. 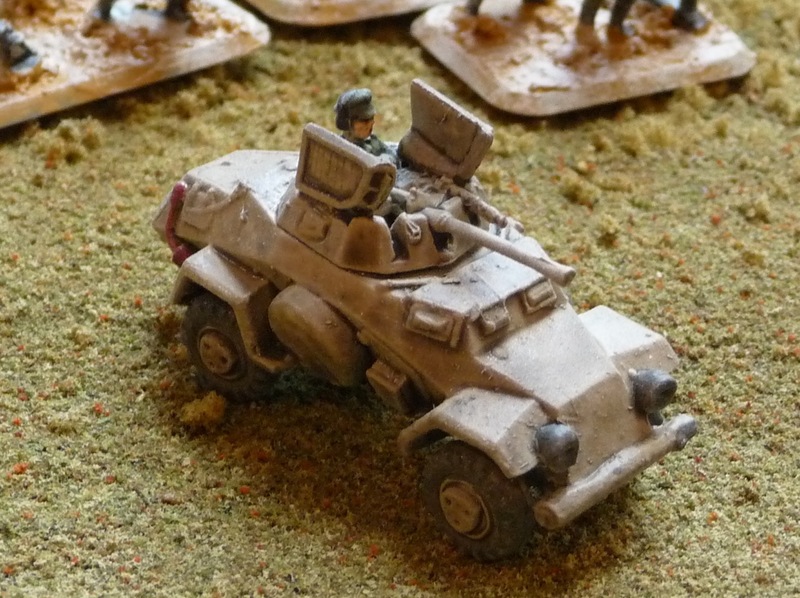 A Battlefront Sd.Kfz 231 from Aufklaerungs Battaillon 33. A captured French Unic P107 leichter Schuetzenpanzerwagen U304 with a 20mm FlaK gun from Panzerjaeger Battaillon 33. Not used it North Africa. BattleFront PaK 38 5cm Anti-tank guns also attached to Panzerjaeger Battaillon 33. 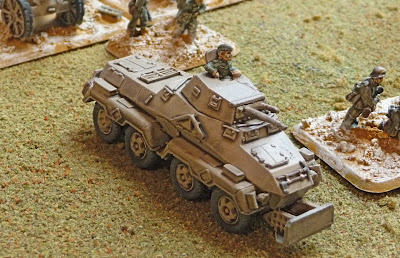 Sd.Kfz 222 gun from Battlefront, armed with 2 cm KwK 30 L/55 autocannon and a 7.92 mm MG34. Attached to Aufklaerungs Battaillon 33. 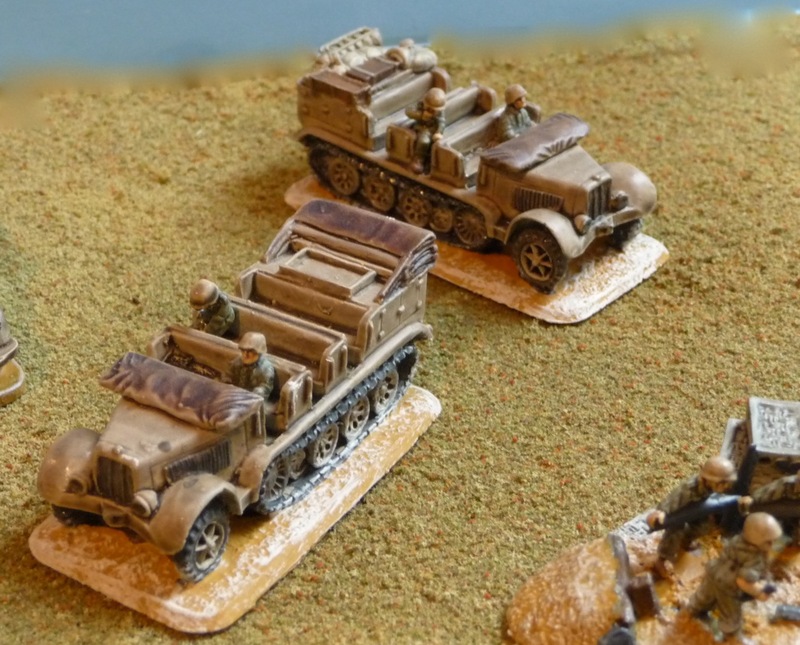 Opel 3 ton trucks from Forged in Battle. They will be used to transport the pioneers. I have decals for the vehicles, but am still deciding about camouflage. 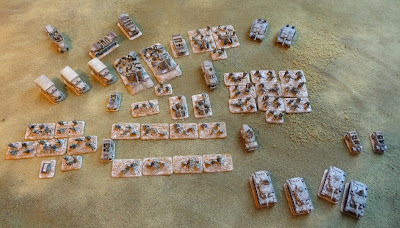 I have a few vehicles left to paint for the DAK forces for my starter scenario, including a Panzer II and IV as well as a few more stands of Panzergrenadiers. Then on to the 8th Army! Looks like a battle is afoot. I feel bad for the other side. Those are indeed medium mortars (8cm) - heavy 12cm mortars are almost taller than a man and would have a distinctive round base plate I think. Thanks, I just checked back with the FiB site and they are indeed the 8cm mortars, they also sell the 12cm mortars which are as you describe. Great job, John! That is an incredible achievement for only six weeks work - wow. Now you just need some captured British equipment for additional character (perhaps a Bedford or few armoured cars). I hope you have some good fun with them! 100,000 pageviews and a new blog title!